Turkey Select is a high quality chufa seed that attracts and holds turkey on your property. Chufa plantings are considered by many to be the #1 attractant for turkey. The nut-like tubers produced by Turkey Select are scratched up and devoured by turkey. The tubers are high in carbohydrates and protein and are also great for waterfowl. Turkey Select is easy to grow and will mature in 100-120 days. It should be planted at 10lbs per ¼ acre and can be grown in almost any part of the country. Spring and early summer is planting time. 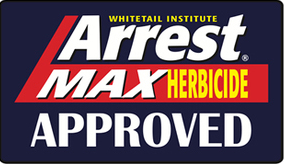 Arrest Max is an excellent herbicide to keep Turkey Select Chufa plots free from unwanted grass competition. *At this time, Turkey Select Chufa cannot be shipped to Michigan or Connecticut. Over the last 6-8 years I have researched a food plot option for turkeys. We have land in jack-pine country that has soil that is mainly sand with low PH and is acidic. Rain is also very important and the timing of it is so critical. This is the first year that I have tried the chufa seed from Whitetail Institute as an option. So far it is growing great and I am very positive that it will be an excellent draw for turkeys, deer, bear and really all wildlife !! I look forward to a successful season and hope to write another report with some very good results. If so, I look forward to planting much bigger plots of this chufa seed from Whitetail Institute !! I have used your food plot mixes for years and have my two neighbors planting them too. One of them has planted the TS Chufa the past 2 spring seasons with awesome results. All my turkey are on his property. Now I've got to plant some to get them back. Congrats on spreading your knowledge to seed for turkey. It's a winner. I've used your products for years with great results. Last year I tried the turkey select and it worked fantastic. My fall turkey season was my best ever and then the following spring the turkey were mauling the Chufa. Great product. Planted this spring and even without much rain it's up and growing well. This will our second time planting your Turkey Select. If it works like last years planting, I'll be eating some turkey with my venison.